Jackson, Blyden. Operation Burning Candle. New York, NY: The Third Press, 1973. Aaron Rogers, a brilliant student in Medicine and Psychology, suddenly gives up his studies and enlists to fight in Viet Nam. One day his family in Harlem, receive an official telegram informing them of his death in battle. While the family is waiting for the body, Sissy, Aaron's sister, sees a man in a car at a street corner that she is positive is none other than her brother Aaron. She is puzzled. The Police are equally puzzled about some unusual events around this same time. Several banks are raided with efficiency and expertise by groups of Black men. Police informers are mysteriously murdered in Harlem. All the fire alarms in Manhattan at the same time one day, and the subway system on the West Side is short-circuited on another day during the rush hour. Police suspect that there is a new, well-trained group in Harlem but are unable to gather any information as to the identity of the group. After years of waiting a group of Black fighters has finally emerged in Harlem, with Aaron at its head, decided to strike for the race. 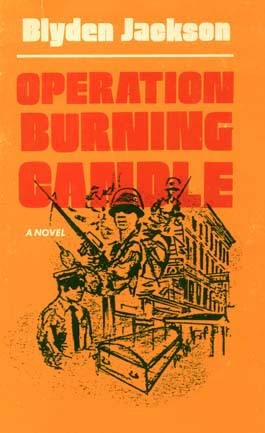 Composed of Black Viet Nam veterans who, through a strategem, all return incognito to the U.S. while officially listed as killed in action, the group successfully eludes the Police and is able to carry out its appointed mission baptized "Operation Burning Candle." This is a plan to assassinate, during a Democratic Convention at the Madison Square Garden, the most die-hard of the Southern Senators who continue to stand in the way of progress for Blacks. With a well conceived plot and many tension-filled moments this is a gripping and compelling novel. New York City Banks are repeatedly raided with devastating efficiency... Two police informers are brutally and mysteriously dead... The subways are sabotaged at rush hour... During one five-minute period, false fire alarms clang from every box in the city... And every time a cadre of highly-trained, disciplined and bitter Black Vietnam Vets was responsible. Then the radio announcement came: "Stand ready, for we strike within the next seventy-two hours for our freedom... All power to the people." Seventy-two hours — and the police still didn't know how to stop Operation Burning Candle — or even what it was!